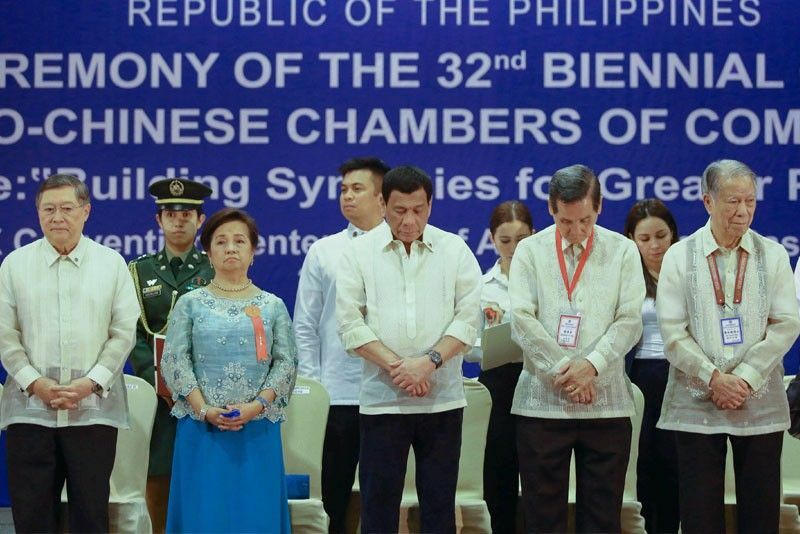 Duterte said the Federation of Filipino-Chinese Chambers of Commerce and Industry Inc. (FFCCCII) has played a vital role in promoting greater cooperation and understanding in business and trade, and in various challenges that the Philippines faces as a nation. MANILA, Philippines — President Duterte has thanked Chinese-Filipino business groups for supporting his campaign against crime and urged them to continue helping the government improve the country’s business environment. “Let me take this opportunity to thank you for your support of this administration’s fight against the scourge of corruption, criminality and illegal drugs. Through your deeds, you have become our important partner in building the foundations of a more inclusive and sustainable society,” Duterte said during the 32nd Biennial FFCCCII convention in Pasay City last Thursday. “May the strides your organization have made in recent years encourage you to come up with more initiatives that will enhance the growth of your industries and cultivate a greater business environment in the country,” he added. Duterte expressed hope that the chamber members would pursue greater collaboration and continue their charitable works as he noted that the FFCCCII has been leading initiatives that help the youth, the poor and the victims of calamities for more than six decades. “Indeed, the meaningful ties of friendship forged between Chinese and Filipinos have enabled us to empower our people, especially those who are vulnerable and marginalized,” the President said. FEDERATION OF FILIPINO-CHINESE CHAMBERS OF COMMERCE AND INDUSTRY INC.